Meatloaf is an underrated comfort food. While some meatloaves can get dried out, a good meatloaf is moist, savory and oh so delicious! Knowing how to make fresh meatloaf is a great cooking skill to have, and our easy recipe is a great one to try! It comes together quickly, and the oven does the rest. While the meatloaf bakes, all the flavors come together and complement each other perfectly. Meatloaf is also a great dish to prepare ahead of time and then bake it when you want it. If you have more free time during the weekends, make your meatloaf on a Sunday, then keep it in the fridge until you bake it for dinner a few days later. If you’ve had a long, tiring day, there’s nothing quite like being able to slide your prepared meatloaf out of the fridge, relax while it bakes and enjoy a delicious meal. 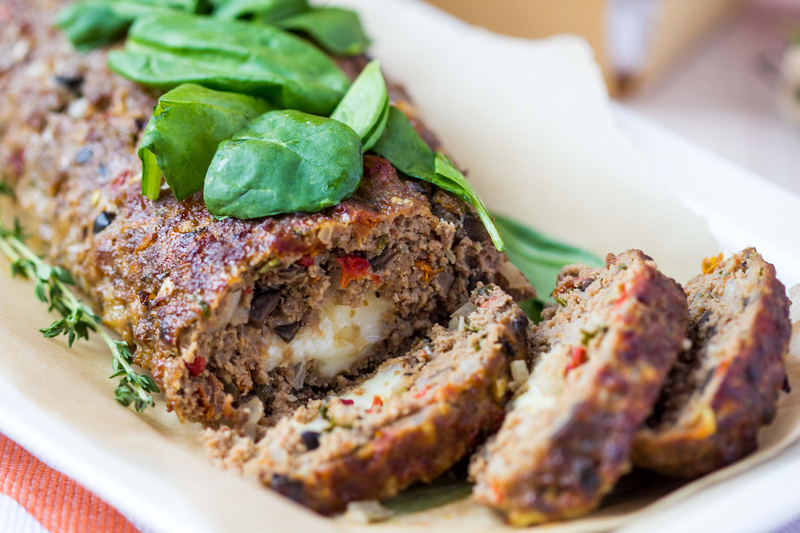 If you want to make our delicious meatloaf made with eggs, check out the recipe below! In a large bowl, add the ground beef, egg, chopped onion, chopped red bell pepper, olives, bread crumbs, salt, black pepper, and garlic powder. Knead the mixture until all the ingredients are evenly combined. On a lipped cookie sheet, pat the beef mixture out to a large rectangle. Sprinkle the shredded cheese evenly over the meat. Gently roll the ground beef along the shorter end of the rectangle. Seal the ends. Lightly grease a baking dish and place the formed meatloaf into the dish. In a small bowl, combine the brown sugar, spicy brown mustard, and ketchup. Stir until well mixed and pour it over the meatloaf. Cover the baking dish with aluminum foil. Bake the meatloaf for one hour — or until the internal temperature reads 160°F. After you bring the meatloaf out of the oven, let it rest for about five to 10 minutes. When you cook and bake for yourself and your family, you’re mindful of finding the best ingredients. You know that when you put good in, you get good out. High-quality ingredients transform a dish from decent to delicious. At Sauder’s, we are dedicated to providing our customers with the highest quality and freshest eggs. While you’re cooking this easy meatloaf recipe, be sure to use Sauder’s eggs! To find our top-quality eggs at the nearest retailer, please take advantage of our store locator today!